Herman Miller is a leading manufacturer of office furniture and has been at the forefront of innovative research and design in this field for decades, producing iconic designs throughout its history. The company is also committed to producing environmentally friendly products, indeed most of their office chairs are made of over 90% recyclable materials. The styles and designs of the company’s chairs have evolved over the years, in response to both the differing needs of the modern workplace and the influences of contemporary art and design. One of the early influential office chairs produced by Herman Miller is the Soft Pad chair, designed by Charles and Ray Eames. The chair was introduced in 1969 and features leather upholstery, consistent with many contemporary furniture designs from the period. The use of aluminium throughout the design of the chair is not only an aesthetic feature but also provides a solid base of support. One of the influences of the chair was the method of stretching material tightly between two vertical points to create a backrest, a method which at that time was almost exclusively found in outdoor furniture. The Soft Pad chair utilises this concept by stretching the leather found in the backrest between two aluminium rods, creating a firm yet comfortable support with enough flexibility to cater for the differing shapes and sizes of its users. 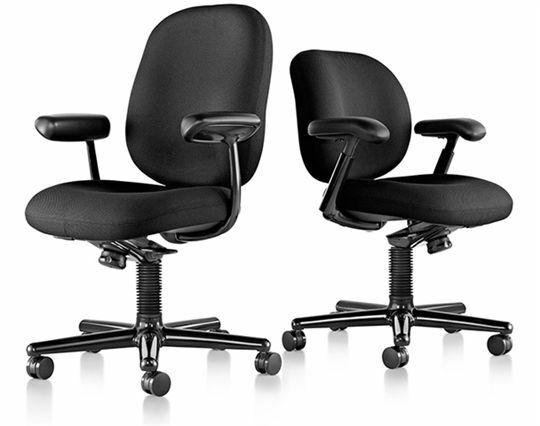 Another notable aspect of the design is that the rear cushion is shorter than in many chairs of the period. The chair features gliders on each leg to enable movement around a workspace. The height of the chair can also be adjusted manually as necessary. In 1976, Herman Miller introduced the Ergon chair. The chair was designed by Bill Stumpf and was the result of a number of years of research, focusing on the long-term effects of sitting in a fixed position. The research studied, in particular, the restriction of circulation and effects on the muscles of prolonged sitting. This research may be reflective of the gradual increase in office employment and duration of desk-based work at that time. This chair introduced an oval-shaped cushion design for the armrests, which were to provide additional elbow support. This is particularly useful for computer-based tasks such as typing, which were becoming much more prevalent during this period. The shapes of the cushions have also been adjusted with the addition of grooves for increased comfort. In addition, the chair features a gas-based cylinder under the seat to lessen the impact of increased weight and pressure. This also provides a smoother and more comfortable experience, especially when adjusting the height of the seat. The next major development came in 1984 with the Equa chair. Featuring 5 legs for increased support and mobility, the chair was designed with an emphasis on being ergonomically supportive. The chair consists of a one-piece shell made from a polyester resin providing a strong and aesthetically unique design. In the initial years of production, the chair was also available without upholstery. The backrest features an ‘H’ shaped gap to separate it from the seat. This also creates another unique aesthetic by which the chair can be defined and recognised. 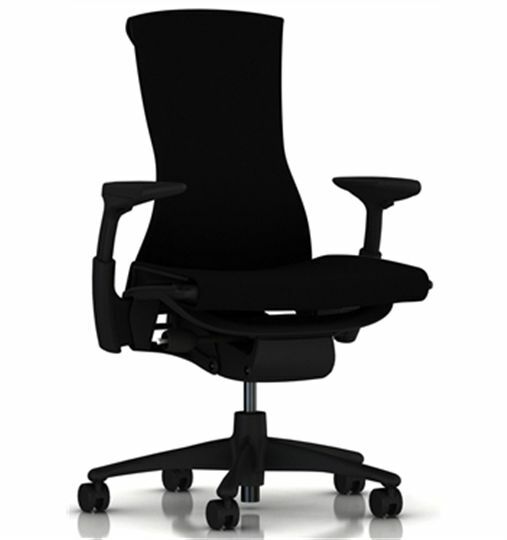 The chair also retains the oblong shaped armrests seen in the Ergon chair. In the early 1990s, designers Bill Stumpf and Don Chadwick sought the opinions of a different demographic than previous studies which had centred on office staff. For inspiration and guidance for their latest model, the designers decided to look extensively at the needs and opinions of elderly people in retirement homes. Although this research was not initiated with office furniture in mind, the findings of the research strongly influenced subsequent office furniture design. The designers recognised that the residents of these homes would likely be accustomed to sitting in one chair for a prolonged period, on a daily basis. The result of this extensive research was the Aeron chair. The design of this chair is strikingly different aesthetically from previous Herman Miller designs. The relationship between design and function in this chair is evident; each contributing to the other. The lack of upholstery is perhaps the most striking feature and leaves the fabric of the chair clearly visible. The backrest features a woven fabric stretched between the sides of the chair. Inspiration from the Soft Pad chair can be seen here. 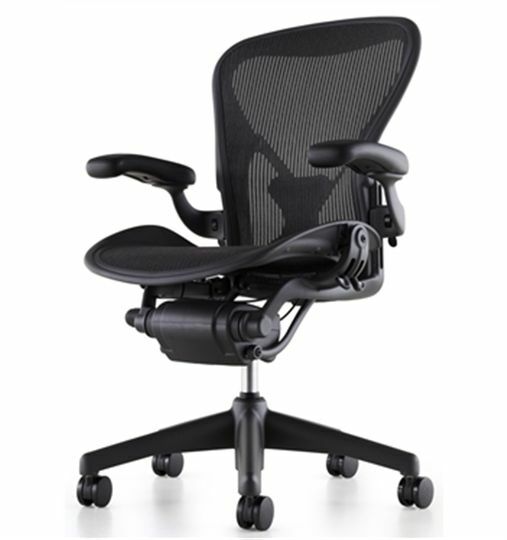 However, in the Aeron chair, the fabric is loose enough to mould itself more closely around the body of the user. The lack of cushions and the mesh-like nature of the material mean that air and heat can pass through easily, negating the build-up of heat that sitting with leather or other upholstery moulding around the body would otherwise cause. The transparency of such a design is also an intentional aesthetic feature to reduce the obtrusiveness of the chair in an environment surrounded by opaque technology. The Aeron chair was designed to be biomorphic – to mirror the human form. Bill Stumpf claims that there is “not one straight line to be found on an Aeron chair”. In addition to the development and release of new products throughout the years, Herman Miller also refines and develop their existing products to improve usability and quality. This is particularly evident in the company’s Equa 2 model. Whilst keeping the original design’s ‘H’ shaped gap in the backrest, the newer design also incorporates added support in the form of an adjustable lumbar kit. 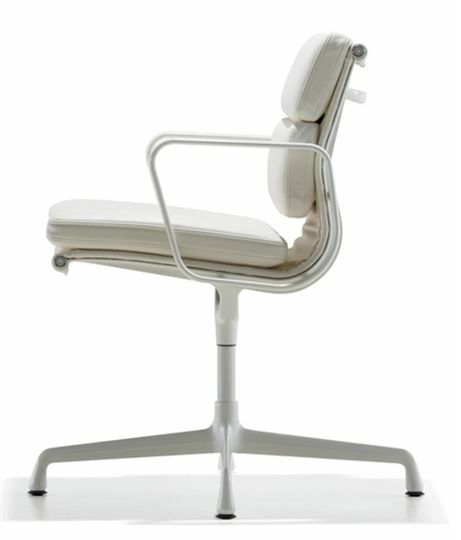 The gap in the backrest allows continuous air flow between the body of the user and the chair. The curvature of the edges in the newer model also echoes the original design. 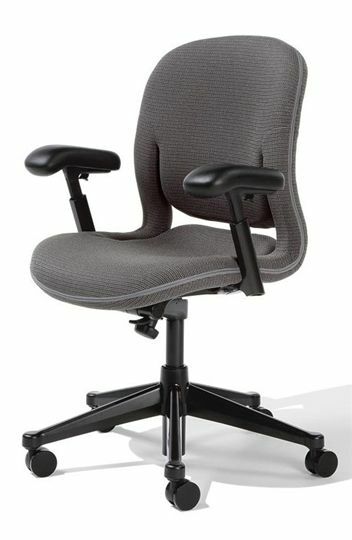 Another addition to the functionality of the chair is described as a “waterfall front edge” by Herman Miller, alleviating any pressure below the user’s thighs. This also allows the user to recline without the front of the seat rising. This also enables the user’s feet to remain on the floor for additional comfort. One of the most significant developments at Herman Miller in recent years has been the introduction of the Embody chair, in 2008. The philosophy behind the purpose of the chair echoes many previous designs and their focus on negating the health effects of sitting in a chair for an extended period of time. The Embody chair is marketed as being “health positive”, therefore not only counteracting the physical effects of sitting on the human body, but actually has positive health benefits, allowing unrestricted blood flow around the body. The design of the back of the chair intentionally resembles ribs, a continuation of the correlation between chairs and the human body first seen in the Aeron design. The backrest of the chair is fairly narrow, allowing the lungs space to breathe, again indicative of a health-centric design. This also gives the arms additional freedom of movement compared with earlier designs. Unlike earlier designs, the backrest features two levels of support. The lower part of the backrest is firm, therefore the lower back is constantly supported, even when reclining. The upper part of the backrest has increased malleability to allow a variety of positions to be assumed whilst maintaining healthy support for the spine. The back of the chair is also much taller than many of Herman Miller’s previous designs, making the option of reclining a stable and comfortable one. This design is reflective of Herman Miller’s philosophy> over the last 50 years. With the initial research and the health-neutral chairs of the 1970s, the focus on comfort and health has remained at the forefront of design up to the point where a health-positive chair is now commercially available. Herman Miller’s chairs have been developed alongside a backdrop whereby office tasks are becoming more prevalent and varied than ever before. Additionally, the duration of users’ days which are spent sitting are also on the increase, mainly due to the power and convenience which modern technology brings. The health-positive chairs produced by Herman Miller are not only indicative of this changing workplace, but are also now a necessity within it.